Malwarebytes – The BEST malware removal tool and how to use it! Malware infects almost every PC that browses the internet. Whether we know it or not. There are a number of different tools to clean it up. Some free and some cost money. As you know from reading previous posts on my blog I’m about bang for buck, and spending money wisely. I want you to do the same. I’ll share my tools with you, so you don’t have to experiment on various other tools or pay someone big bucks to do this sort of cleanup for you. You can do this yourself, and I’ll walk you through it! 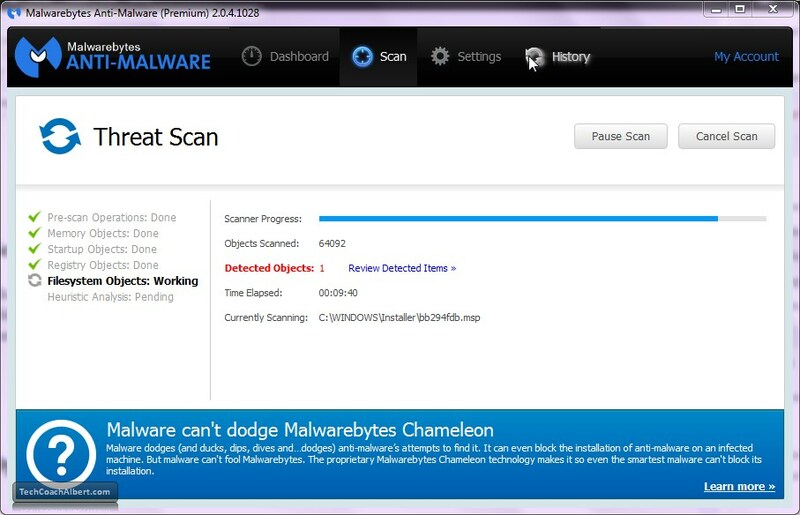 Malwarebytes is one of the best-known malware removal tools out there. You can and should only download it from their website: www.malwarebytes.org. The last thing you want to do is install a fake copy of it and infect your PC even worse. Now that you have the software installed, you can scan your PC to find and then fix the issues (and it’s a very high probability you have AT LEAST one!). The following section will guide you through scanning your PC for Malware. To get started, click on the Scan option on the top menu bar, as shown below. Next, we’ll need to choose what scan we want to do. I would suggest just running the Threat Scan, as it includes all the scanning features within it. Click on the Threat Scan option on the screen to start the scan. The following screen is what it will look like during the scan. Be patient, as the scan can take anywhere from a few minutes to a good hour or more. All depending on the speed of your computer, how many files are on it and the amount of resources available. If you see the screen below, that means you’ve found at least one infected file. Note the red Detected Objects counter in the middle of the screen. We’ll discuss how to clean them up in section 4. If you made it through the scan and nothing was found, you’ll end up seeing a screen similar to the one below. Good news! Your PC is clean! But, if you’re on the internet it wont stay clean forever. No need to check out step 4 at this point. but I would recommend running a scan weekly or monthly, depending on how much you’re on the internet. purchase, some of the proceeds are given back to me to help run this website!